GOKPOP | Exclusive K-News in Malaysia & Singapore: So Ji Sub 2017 Fan Meeting Tour TWENTY: The Moment in Singapore on 9 April! 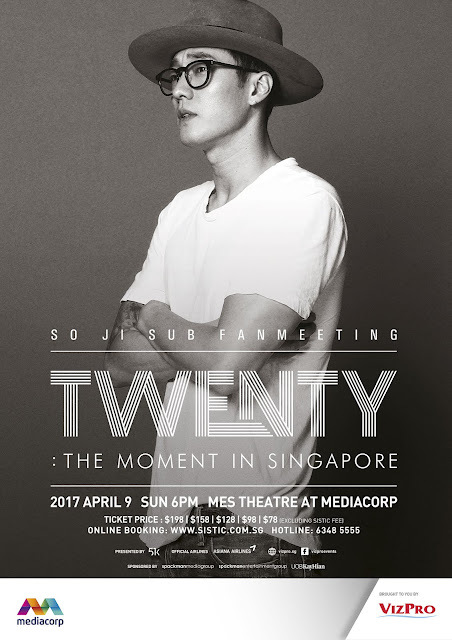 So Ji Sub 2017 Fan Meeting Tour TWENTY: The Moment in Singapore on 9 April! Singapore, 7 March 2017 – Korean star So Ji Sub will be gracing Singapore's shores on 9 April 2017 at 6pm, MES Theatre at Mediacorp. Tickets are on sale now starting from 10 March 2017, 9am. So Ji Sub last came to Singapore in 2014 and since then, he has starred in other titles like, Oh my Venus, Good day, The Warship, released a mini album “SO GANZI”, a coffee book – Jisub, Haruharu and won the KBS Best Male Actor Award. Born on 4 November 1977, this Korean hunk made his entertainment debut as a jeans model, he became known for his leading roles in the television series I'm Sorry, I Love You (2004), Cain and Abel (2009), Phantom (2012) and Master's Sun (2013) as well as the film Rough Cut (2008). So has also released several hip-hop EPs. So be prepared to be entertained by this multi-talented Star as he grace our shores on 9 April 2017. Tickets are now available for purchase at all SISTIC channels or call 6348 5555 for booking. This event is brought to you by Mediacorp Vizpro International Pte Ltd.